Tidal vegetation, which in the eastern US includes estuarine emergent marsh, tidal freshwater marsh, and mangroves, is a priority habitat for ACFHP in the Mid-Atlantic, South Atlantic, and South Florida subregions. Estuarine emergent salt marsh is an environment in the coastal intertidal zone between land and brackish water. The low marsh zone floods twice daily, while the high marsh floods only during storms and unusually high tides. Smooth cordgrass (Spartina alterniflora) dominates the regularly flooded low marsh along much of the Atlantic coast. In addition, salt meadow cordgrass (Spartina patens), saltgrass (Distichlis spicata), and needle rush (Juncus spp.) species comprise much of the vegetative community of the mid to upper salt marsh and brackish marsh. Tidal freshwater marsh occurs where the average annual salinity is below 0.5. It is found along free-flowing coastal rivers, and can be located just upstream of the salt front, where the river essentially backs up as it meets resistance from high tides. It is characterized by salt intolerant plant species. These include: giant cordgrass (Spartina cynosuroides), sawgrass (Cladium jamaicense), cattails (Typha spp. ), arrow arum (Peltandra virginica), pickerelweed (Pontedaria cordata), blue flag (Iris virginica), and soft stem bulrush (Scirpus validus). 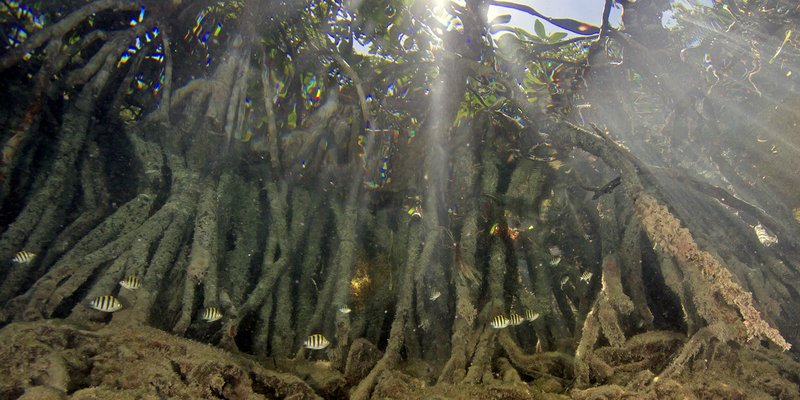 The mangrove ecological community includes four tree species collectively called mangroves. This swamp system occurs along intertidal and supratidal shorelines in southern Florida. The four species found in Florida mangrove swamps are: red mangrove (Rhizophora mangle), black mangrove (Avicennia germinans), white mangrove (Laguncularia racemose), and buttonwood (Conocarpus erectus). Tidal vegetation provides a wide variety of benefits to both marine species and humans. Many commercially important and endangered marine species use these areas as nursing and spawning habitat. The vegetation also filters out pollutants and contaminants, leading to better water quality. Tidal vegetation sequesters carbon at a rate 2 – 4 times greater than tropical forests, reducing the level of CO2 in the atmosphere and helping to mitigate climate change. 2 2012. Status and Trends of Wetlands in the Conterminous United States 2004 to 2009. US Fish and Wildlife Service.